Longridge Town boss Lee Ashcroft hopes to forget their weekend cup defeat by claiming three points at Bacup Borough on Saturday. Town exited the league’s First Division Cup last Saturday following a penalty shootout against Garstang. They travel to face a Bacup side who are sitting 14th in the 20-team First Division North table despite having only lost once in six home league matches so far this season. 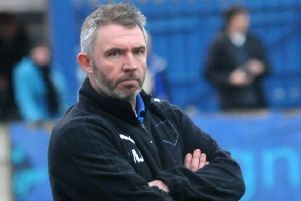 Ashcroft said: “It’s fair to say Garstang are a bit of a bogey team to us, certainly over the last two years. “They’re a decent side, I said before the game it wouldn’t be easy. “We’ve started the season ever so well and we’re really happy with the way things are going. “I’m not going to get myself down over it, we made enough chances to win the game but it wasn’t to be. “If this had been a league game I would’ve been more disappointed, as that is our priority, but I’m sorry for the supporters as it’s never nice to lose a derby match.